BATON ROUGE, La. – Baton Rouge Cardiology Center patients will now have access to heart and vascular care closer to home with the opening of a new clinic location in Central. Dr. Joseph Cefalu, a board-certified interventional cardiologist with Baton Rouge Cardiology Center, will provide cardiology services in Central. For over 15 years, Dr. Cefalu has cared for patients in Central. In August 2016, historic floods devastated parts of south Louisiana and caused the closure of his clinic in Central. Dr. Cefalu will provide services at Baton Rouge Cardiology Center’s Central Satellite Clinic located at 13111 Hooper Road in Central. 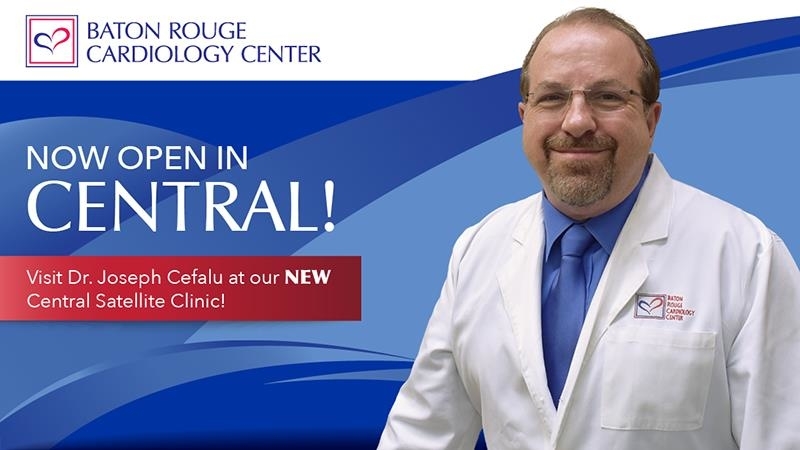 To make an appointment with Dr. Cefalu at the Baton Rouge Cardiology Center Central Satellite Clinic, please call his office at (225) 769-0933 or request an appointment online at www.BRCardiology.com/Central.